You might not have to look much further than your kitchen to find some pretty powerful, natural remedies for a wide variety of ailments. The spice turmeric is one of them. There have been a lot of trials where they have tested turmeric against a variety of diseases with positive results. These trials have shown that turmeric may help to prevent or treat certain cancers and lung diseases. Turmeric is also anti-inflammatory and can help to treat arthritis – both rheumatoid and osteoarthritis – as well as digestive problems, such as IBS. I’ve had stomach problems for years, and I suspect that the pain I have at the base of both my thumbs might be osteoarthritis so for a while I was eating very expensive turmeric supplements. Until that is, I saw programme where they tested turmeric supplements versus plain turmeric spice. The only one that showed positive results was plain turmeric spice. All spices and herbs have health benefits. They contain lots of different vitamins and minerals, and some of them are really rich in antioxidants – oregano, cinnamon and chilli powder to name but a few. It’s really worth adding lots of different spices and herbs to your food. Top it all off with black pepper as it contains a compound called piperine which makes you absorb more of the nutrients in the food that you eat. To solve my own two problems, I have been experimenting on myself lately. As cinnamon is another spice which is good for digestion, I now add half a teaspoon each of ground turmeric and cinnamon and a pinch of black pepper to a couple of tablespoons of coconut yogurt and eat this with some berries every day. 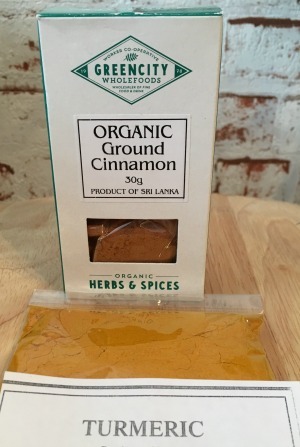 Please be aware though, that it is very important to use the right kind of cinnamon (real cinnamon from Sri Lanka) if you eat it often (Click on Cinnamon Spice). The less expensive and more common cinnamon made from the cassia bark contains a compound called coumarin which can damage your liver if you eat too much of it. I have done this for about four weeks now and without claiming to have conducted a serious medical trial, the pain in my hands is much less now compared to when I started. I’m definitely sticking to this. I don’t know if I have IBS as I haven’t had a test but I have all the classic signs – including a bloated stomach and stomach pain when I eat. So to help my tummy I have done more than just eating these two spices daily. In case I was not producing enough enzymes (enzymes are vital for a healthy digestion) I took a good enzyme supplement for a while and that definitely helped. A nutritionist can do a test to see if you are producing enough enzymes. Enzyme supplements can kick-start your own natural production – as long as you eat a healthy diet containing lots of vegetables and fruit - and as I feel better now I only take them occasionally. Apart from taking enzyme supplements, I decided to cut out most of the food on the so called HIGH FOODMAP list (see below for a link). These are certain types of foods which are often best to avoid if you have IBS. Once you are healed you can try to re-introduce them slowly. I have been doing this on my own but it is recommended that you ask for advice from a GP or a trained nutritionist. I’ve also made more of an effort to eat slowly and chew my food more (I’m such an impatient fool). Chewing gets your enzymes going and eating slowly makes me feel full on less food – instead of doubling over with stomach pain because I’ve eaten too much too fast. And finally, in an effort to limit the stress I cause my tummy with the amount of food I’m eating, I try to replace one meal a day (it doesn’t always work) with a green smoothie that I make myself. 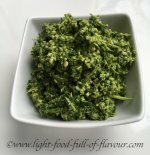 I make it with half a cucumber, a handful each of fresh coriander (cilantro) and spinach leaves, a handful of nuts and seeds, the juice of half a grapefruit, ½ teaspoon of ground ginger, a good pinch of black pepper and half a glass of water. I put all the ingredients in a tall measuring jug and mash it all up with a stick blender. It’s got quite a kick to it and I actually love the taste of it. In an ideal world I’d be eating a bit less as my stomach seems to be at its happiest in that short lull in the morning when it is nearly empty. Unlike my body my appetite is a late riser - but a blooming nuisance once awake. Nevertheless, all the things I have been doing recently have really helped. I’m not completely healed – my stomach still plays up occasionally which is probably due to my resistance to give up certain foods - but I feel so much better.